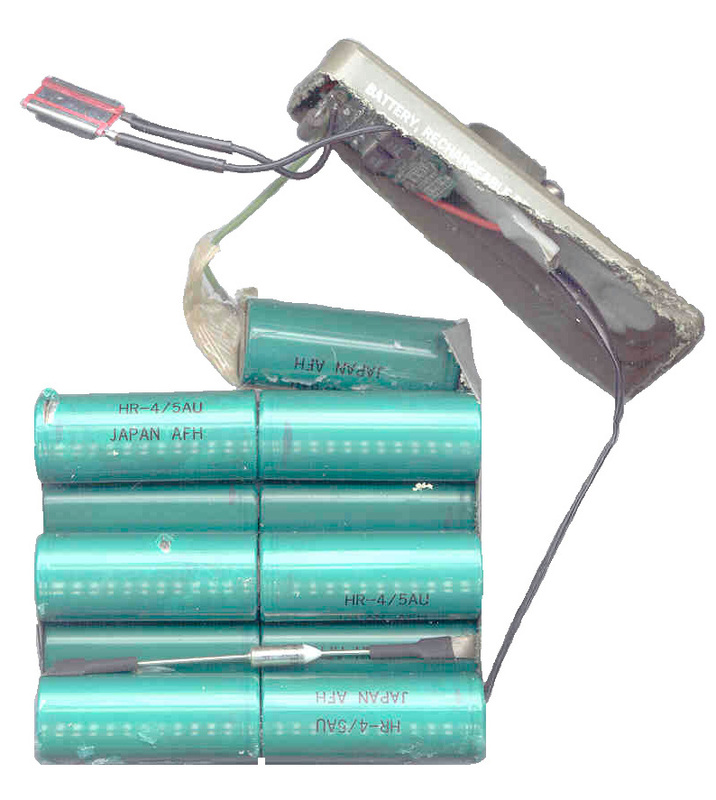 The BB-388/U is a Nickel Metal Hydride rechargeable battery. This chemistry does not have the memory problem that the Nickel Cadmium battery has. There are 11 cells each one is 0.65" dia by 1.65" long (0.547 cubic inches per cell) and a AA battery is 0.55" dia x 1.915" long (0.454 cubic inches). The BB-388 cells are slightly more space efficient, but 11 AA cells will easily fit into the same space. On the top there is an LCD (not LED) "gas gauge" with 5 bars. 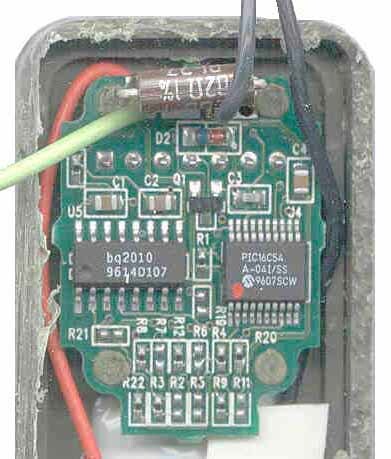 There is also a self resetting circuit breaker connected to the printed circuit board that has the gas gauge circuitry. 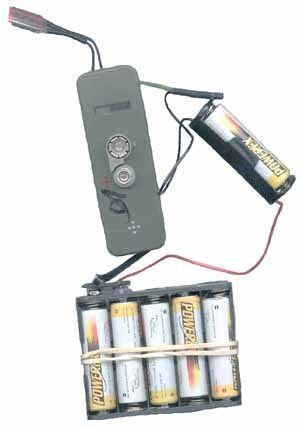 This is not your fathers battery! In the upper right is the gas gage circuit that includes a 0.02 Ohm 1% resistor, a BQ2010 and a PIC16C54 microcontroller. TI - BQ2010, NiCd/NiMH Gas Gauge With 1-Wire (DQ) Interface And 5 LED Drivers - maintains Nominal Available Charge by counting current times time after applying corrections for current and temperature. Also has a self discharge function that's temperature compensated. This is a very smart chip, why the microcontroller? 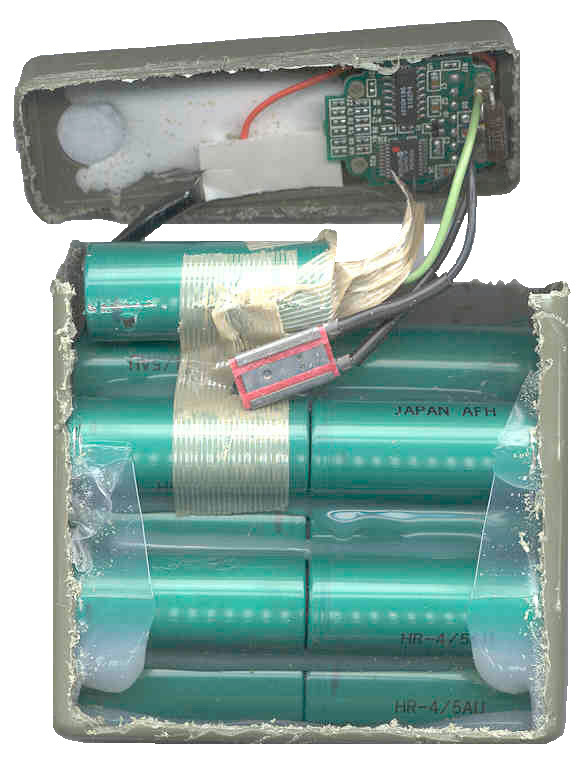 The batteries are marked HR-4/5AU, Japan AFH. It looks like the battery pack was gooped with RTV and slid down into the "cup" part of the battery housing and then the "lid" was fused to the cup. The plastic can me melted with head and probably joined with solvent. Inside view of the front after removing the battery pack from what's left of the cup and pealing off the RTV. There is a thermal fuse in series with the battery pack. Checking each cell showed one cell was a dead short and the other was at 0.13 Volts. The remaining 9 cells were at about 1.34 Volts. The gas gauge has 5 bars for 0-20, 20-40, 40-60, 60-80 and 80-100% capacity. The upper battery is showing all 5 bars on for a full charge indication. The lower battery has its 20-40% bar out, but you can see that this battery is fully charged. Connecting 10 each Maha AA batteries in a 10 cell holder (short one cell form the original 11) causes only 1 bar to show on the gas gauge. Try discharging and recharging the pack through the gas gauge . . . waiting for the discharge through the gas gauge. The key is to find how to reset the micro controller at the correct state of charge. 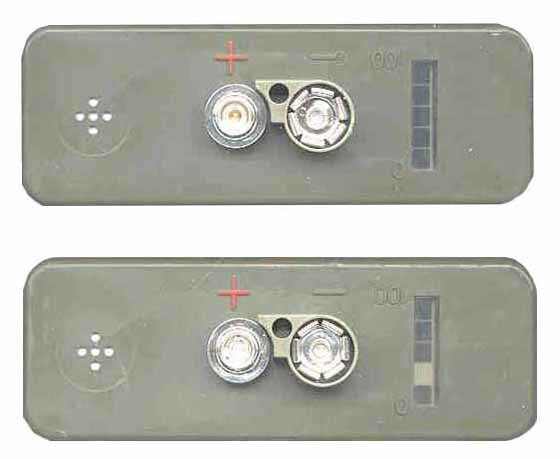 How can I re-set your "State-Of-Charge" indicators on your "BB-type" Military Batteries? A number of techniques have been developed to indicate the charge remaining in a battery. The most accurate at this time reads and integrates as a function of time the current through a precision resistor. In order to calibrate the system the battery must be discharged below its useful voltage and the electronic integrator set to zero. As the battery is charged the resistor signal is integrated by the state of charge chip to a preprogrammed full capacity. The chip outputs a signal indicating the charge level that can be displayed by a series of LED or LCD indicators. The display typically consists of five (5) segments. Each segment represents twenty percent of the battery's capacity. 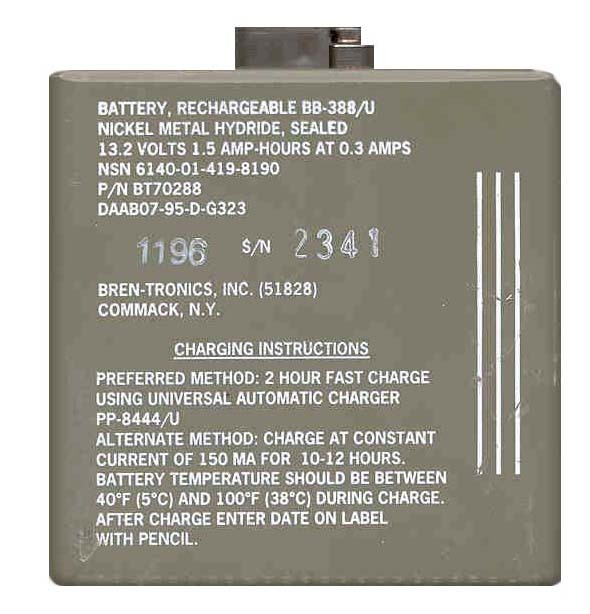 To account for self discharge of the battery an algorithm is written into the chip to approximate self discharge due to the chemistry type and temperature exposure. It must be emphasized, however, that self discharge is an approximate value based on published data from the cell manufacturers. 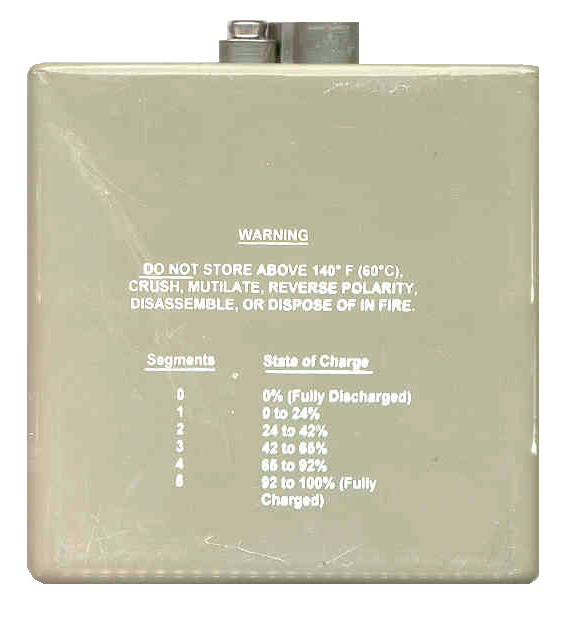 If a battery is stored its state of charge accuracy decreases as time increases. It is recommended that after extended storage a battery be put through a complete discharge/charge cycle to reset the information in the processor. What does "below useful voltage for the BB-388? Ans: below 9.0 Volts. How to reset the electronic integrator? Ans: discharge battery to below 9.0 volts. 1 A for 2 hr, or better 150 ma for 14 hours. 11 AA cells will fit in the case, but still the gas guage will not go above 3 bars. In the above image the temperature sensor has been separated from the battery pack to make the wiring more clear. Normally it is held to the battery pack with the rubber band. I now have 2 more dead BB-388 batteries to experiment on. page created 1 July 2001.